Join us for a parenting roundtable for parents of gifted children on the first Tuesday of most months. 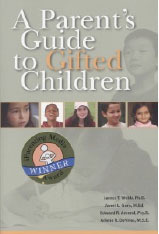 The discussions will loosely follow the book: A Parent’s Guide to Gifted Children by Webb, Gore, Amend and DeVries. Discussions will be held at the Vine Academy, Old Zion Lutheran School Building 2rd Floor, 125 South Vine St, Hinsdale, IL 60521. October 2, 2018: What is Giftedness? We will cover the definitions of giftedness and the most common characteristics of gifted children. Parents might like to read chapters 1 – 3 for this discussion. Gifted children can struggle with school and activities that assume they are less capable than they are. They can get tired of waiting for others to catch up or catch on. Sometimes it is just easier to be like everyone else. Parents might like to read chapter 4 for this discussion. Gifted children often are thinking as a much older child would, and thus discipline can be a challenge. Parents might like to read chapter 5 for this discussion. Giftedness is often accompanied by many intensities which can lead to other problems. It's best to understand and manage the intensities. Parents might like to read chapters 6 and 7 for this discussion. Many social interactions are challenging for gifted children, because they are out of step with social expectations. Parents might like to read chapters 8 and 9 for this discussion. Moral and cultural development are important parental responsibilities. These can be difficult to teach pragmatic, rule-based gifted children. What other complexities do parents of gifted children need to navigate? Parents might like to read chapters 10 and 11 for this discussion. The right educational fit for your child can go a long way to alleviating many of the problems faced by gifted children. Parents might like to read chapters 13 and 14 for this discussion. These sessions will be facilitated by Kathy Nilles and Newenka DuMont. Kathy is the mother of a gifted son, has a master's in gifted education and is the Parent Services Manager and Editor of Parenting for High Potential for the National Association for Gifted Children. Newenka is the parent of two gifted daughters, the president of the Chicago Gifted Community Center, on the board of the Illinois Association for Gifted Children and a master SENG Parent Group Facilitator. For members there is a $10 fee for the entire series, or you can register for each session separately for a fee of $3 each. For non-members the fee is $6 each. (Won’t you consider joining today? Annual membership is $25?) Fee waivers are available, contact Newenka DuMont for more details. Interested in helping us start a Speaker Series someplace near your? Let us know!